In Orlando, Virginia Woolf explains that “No passion is stronger in the breast of man than the desire to make others believe as he believes. Nothing so cuts at the root of his happiness and fills him with rage as the sense that another rates low what he prizes high.” This precise breed of rage has compelled me to write a defense of Michael Grandage’s Genius. Critics have been merciless and viewers were equally unimpressed — 48 percent and 59 percent respectively on Rotten Tomatoes. I saw the film twice in its brief run and I’ve since read Look Homeward, Angel. The Maxwell Perkins biopic (based on A. Scott Berg’s Max Perkins: Editor of Genius) had been on my radar for over a year and I harbored skepticism over whether the filmic medium could do justice to a pivotal figure in American literary history. The movie won me over completely and though it had its faults I recommended it to anyone who would listen — booklover or not (which I now realize may have been misguided). Genius focuses on Perkins and Thomas Wolfe’s friendship, working relationship, and the events that led to Wolfe’s leaving Scribner’s to prove he could be successful in his own right without Perkins’s editing propping up his work. The plot also follows Perkins’s relationship with his wife and daughters, and Wolfe’s tumultuous romance with Aline Bernstein. The film asks questions: What proportion of his life should a man devote to his work? Is this proportion different for an artist? What role should an editor play to a writer? Did Perkins exert undue influence over Wolfe’s work? When I read the reviews I was somewhat surprised at the negative reaction, but more surprised that there wasn’t at least one high profile review that lauded the film. Major critics were uniformly unenthused. They say Jude Law’s Thomas Wolfe was hammily acted. The foot stomping and hand clapping and “Aw, shoots” likely inspired this maligning of Law’s portrayal. These manifestations of Southerness are too unsubtle and cliche. But the writer was a ham. He is known for his larger than life personality and verbose style. Also criticized: Law’s southern accent sounded too hillbilly and not aristocratic enough. In Look Homeward, Angel — Wolfe’s virtual autobiography (or as near as a work of fiction can be) — the Gants are no aristocrats. They are poor folk. Wolfe is from a humble background and his accent and his southern affectations have only become cliche, have only become affectations, because they are used as quick identifiers for Southern fictional characters. The Southern gimmick is rooted in the reality of authentic Southern qualities and behaviors that existed in real people at one time. A.O. Scott of The New York Times excuses the actors, instead blaming the screenplay, “the actors can perhaps be forgiven, since they are continually pushed into scenes that seem designed to halt subtlety in its tracks.” This lack of subtlety contributes to the primary criticism of “cheesiness,” which is identified in Jude Law’s “hammy acting” and the bromance premise of the movie. I formed a self-righteous theory: those panning the movie were unsympathetic to the world of Perkins, Wolfe, F. Scott Fitzgerald, and Ernest Hemingway. This theory is self-aggrandizing certainly, but it may explain the extreme divide between polemical reviews and paeans to the film. Reading reviews on Rotten Tomatoes, it appears Genius suffers from a love-it-or-hate-it polarization that is likely rooted in its somewhat abstruse subject matter. Maxwell Perkins is a hero to lovers of American literature, but he is unknown to the general public. 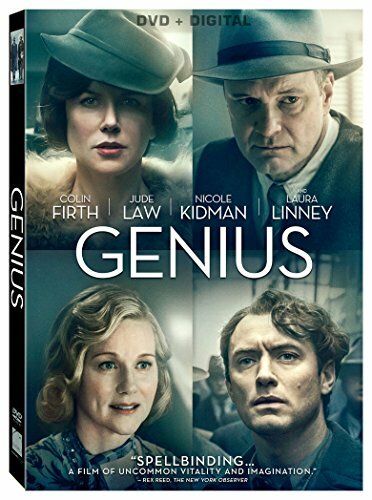 I would expect that the majority of people who saw Genius during its short life in theaters were already acquainted with Perkins and his authors. This precondition could explain the 10 percent gap between critic and audience ratings. Say audiences had at least a tenuous grasp of Perkins’s story and a fondness for the publishing industry in the 1920s — they would be partial to the movie before stepping into the theater. These are the reviewers who would advise you to ignore the philippics (“Don’t allow other reviews to prevent you from an opportunity to experience something very special”), express regret for the unflattering reviews (“Sorry to see your low score”), and care so much as to experience indignation (“I’m incredulous at the bad reviews of this movie”). David Fear levies what sounds like an accusation of intellectualism: “Every scene seems to be lit in a way that screams ‘you are watching a prestigious period pic.’” Could it be a fair accusation? Is it possible that being estranged from the works of the famous writers depicted prevents the audience from fully engaging with the movie and misinterpreting a director’s reverence for pretentiousness? There is a mythic quality about Maxwell Perkins for those who worship at the altar of American literature. Non-believers may not be able to see how or why such a figure commands such interest if they are unfamiliar with the history he helped create. Of course a movie should not only be appreciated by an audience that already favors its content, but it should be noted that the biggest fans are often the harshest critics. Consider any superhero film — the diehard fans pick apart inaccuracies and find innumerable faults. What matters and ultimately decides if the diehards approve of an adaptation is whether it is respectful to the spirit of the source material, even if the details are impossible to stay entirely true to. Genius is true to the spirit of Thomas Wolfe — he is how I imagine the author of Look Homeward, Angel must have been. For the movie to resonate you must have either an appreciation for the works Perkins edited or a prerequisite interest in the questions listed above. I came to the movie with both. I judged the movie as I judge most — did it accomplish what it set out to do? I believe so. I was inspired to write; I was moved by the friendship; I was scared by the power of pride and love and regret. But it is possible that my love for the film is due to my furnishing of details, my reading into a richness of character that was not spelled out in the film. Herein lies the movie’s greatest weakness: Genius relies on a sympathetic audience. And so what I wish to impress upon you is that if you are of this number you may find the film not only lovable, but moving and worth re-watching. I do not believe Genius should win Best Picture or even be nominated. But I do believe it was dismissed unfairly and that its main criticisms are misplaced. Reviews penned by those who do not have a predilection for the Lost Generation and the works they produced state that a movie about editing is simply not cinematic. Many critics belabored the red pencil circling and underlining shots as demonstrative of the unimpressive and uncinematic act of editing. Peter Debruge says, “it’s nobody’s idea of interesting to watch someone wield his red pencil over the pile of pages.” Genius is about more than editing, but it does successfully illuminate its perils, and the moral crisis editors face in shaping someone else’s work. I will not deny that more people are interested in organized crime than book editing when it comes to sheer volume — but that does not classify editing as unfit for cinema. “Cinematic” is not a fixed quality — any story can be cinematic if it is told artfully. The criticism that the process of publishing a book is not cinematic speaks more to narrow-mindedness and generalizations about what the masses find interesting than any failure on the movie’s part. But again, this takes us to the interests the audience must bring to the film. The film itself may not be able to inspire an interest in editing for someone who did not already harbor one. My message is for those who may have been interested in Genius but were deterred by the widespread and unvaried denunciations of the film. You should give Genius a chance (especially if you have read something Perkins’s red pencil touched) and trust that critics’ rejections might have been misplaced. Anyone who has ever loved an author through his or her work should find something to love in this film. Sanibel Chai studied classics at UPenn and now lives in Manhattan. She is working on a novel. If you ascribe to the notion that, more than anything, great art disturbs, Reitman has indeed crafted something lasting. I also do think that this movie is underestimated. I loved it, the acting, the story. It also was so inspiring for me that i intend to write again after some time. Thanks for your appreciation.